3 The number of midwives in England over the past decade has been around a quarter less than the number needed to deliver satisfactory levels of maternity care. The current shortage of midwives is over 5,000. 4 Births to migrant mothers often involve disproportionate demands on maternity services for clinical and cultural reasons so the average cost is higher than for mothers born in the UK. The average number of births each year over the ten year period 2011/12 to 2020/21is projected by the ONS to be almost 90,000 higher than the average for the decade 2001 – 2010. 6 A fifth of all births in England are in London which is the English region where maternity services have been most heavily impacted by migration. Over 40 per cent of net migration is into London. Over the past five years the birth rate in London has increased by 10 per cent compared to the overall rate for England of 8 per cent, and the ONS projects that births in London might increase by a further 10,000 a year over the next ten years. .
7 The special demographic profile of mothers in London imposes disproportionately large impacts on maternity services. A majority of births in London are now to mothers who have been born overseas. Complications in pregnancy are more frequent for this group of women, as is a higher fertility rate. Both these factors impose significant additional demands on maternity services. Difficulties of communication are a further factor. budget. Out of this, births to mothers born outside the UK had a cost to the NHS of over £400mn. 10 Over the past decade (2001 – 2010) number of midwives in England has not kept up with the increase in births. Table 3 below shows that between 2001 and 2010 the numbers of births in England increased steadily every year, growing overall by 22 per cent, significantly less than the growth in midwife numbers, which increased by some 15 per cent. 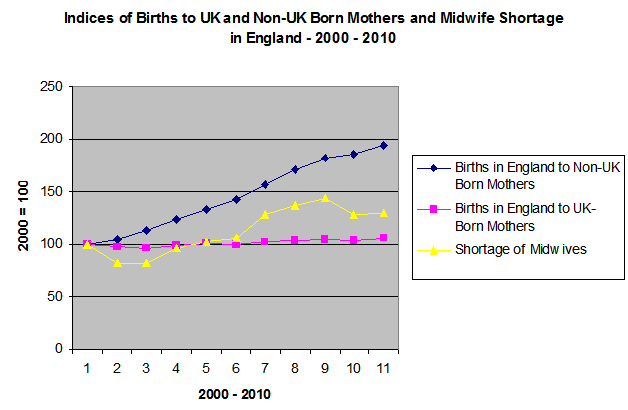 12 The chart shows that the shortage of midwives increased every year from 2002 to 2008. The biggest factor causing this shortage was the increase in births to non-UK born mothers, which accounted for over 65,000 births, growing by over 60 per cent. Births to mothers born in the UK over the same period increased by almost 42,000 – a growth rate of some 9 per cent. Out of the total increase in births in England in this period, over 60 per cent were to mothers born outside the UK. Pressures in London may be particularly intense because of the special challenges of maternities there and the high cost of housing. The Local supervising Authority for midwives in London in 2010 reported that there was a vacancy rate of 16 per cent for midwives in London and that the average age of midwives there – 42 – meant that many were coming up to retirement. “more pressure and frustration” than other medical staff and there is greater distress and unhappiness expressed among a greater proportion of midwives than medical staff. impact on the quality of maternity care. It is widely accepted that all women should have one-to-one midwife care during labour, but this is frequently not available. 15 A joint survey by The RCM and ‘NetMums’ found that, among over 3500 mothers surveyed, 43 per cent had reported that, after giving birth and on a postnatal ward, they did not have access to a midwife. 16 The optimal number of midwives is calculated by assuming that 38 midwives are required for every 1000 deliveries if a satisfactory standard of care is to be provided. 38 is the average of the 36 to 40 range recommended by clinical experts. The shortage of midwives is calculated by subtracting the Full Time Equivalent of midwife numbers from the optimal number as calculated above. GDP deflator measures economy-wide price changes. In 2008/09 it was 2.77, in 2009/10 1.63 and in 2010/11 2.97. Access to the NHS - Who Should Be Entitled?